A public vote to select a new entrance sign for Bonshaw has wrapped up this week, with the village’s residents choosing the winning design. Inverell Shire Council mayor Paul Harmon explained two choices were put to residents, with residents in the Bonshaw area mailed a voting slip and encouraged to take part. “Council worked with the Bonshaw Hall Committee to determine what residents would like to include on the signs and Danthonia developed designs based on these suggestions”. The two choices were put to residents, with both portraying Bonshaw as the heart of the Dumaresq River valley. Cr Harmon explained the project to install signage came about after Council met with residents to discuss improvements and adding signage to the entrances of the village. “The signs will be funded by a New South Wales Government grant and will be produced locally by Danthonia Designs”. Cr Harmon said the designs signs reflect Bonshaw’s landscape and showcase the diversity of agriculture found in the Dumaresq valley. “Production in the Bonshaw area includes cattle, cotton, wine grapes and more recently, pecans and peanuts, so the Danthonia designers had a challenge on their hands to include the variety of farm produce”. Over 70 percent of residents participated in the vote, which was restricted to households in the Bonshaw area. “It’s certainly fantastic to see so many residents having their say and it’s been a very tight contest between the two designs”. Cr Harmon indicated feedback from voters has been very positive, with residents commenting it will add a welcoming touch to the village and the winning design’s traditional navy-blue background will set them firmly apart from their Queensland neighbours across the river. Installation of the signs will see Bonshaw join the likes of Yetman, Ashford, Gilgai and Delungra with their own uniquely designed, hand carved signs. 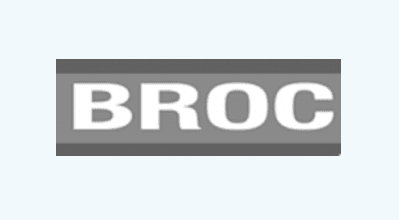 Residents can expect to see the signs installed in the coming months. 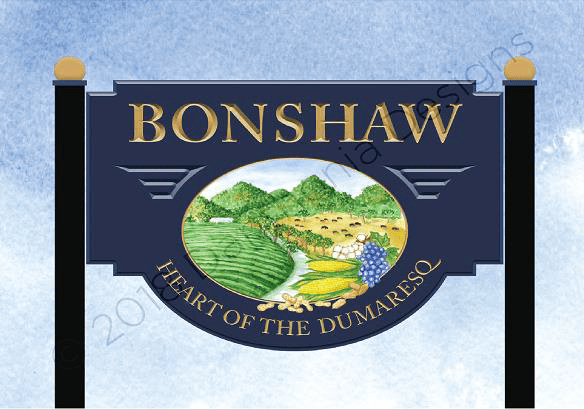 The winning design of Bonshaw’s soon-to-be installed signs.